(CBS News) Researchers are hopeful that diagnosing depression may soon be as easy as diagnosing high cholesterol. A new study describes a blood test that that distinguished depression among teenagers. Antidepressant use soars, study says: Is depression overdiagnosed? Developed by a scientist at Northwestern School of Medicine in Chicago, the new blood test aims to replace the current method of diagnosing depression, which is asking patients to recall their symptoms. The researchers say the new test might be able to distinguish between certain types of depression, raising hope for more personalized treatments. "Right now depression is treated with a blunt instrument," study author Dr. Eva Redei, a professor of psychiatry and behavioral sciences at Northwestern University Feinberg School of Medicine, said in a written statement. "It's like treating type 1 diabetes and type 2 diabetes exactly the same way. We need to do better." Redei's study is published in the April 17 issue of Translational Psychiatry. Teenage years are prime time for depression to start. According to the researchers, rates of major depressive disorders jump from 2 to 4 percent in pre-adolescent kids to 10 to 20 percent by late adolescence. Untreated depressed teens raise their risks for substance abuse, social difficulties, physical illness and suicide. That's why it's so important to get an early and accurate diagnosis, according to the researchers. "This is the generation, the age group that needs the most help," Redei told WebMD. For the study, Redei's team looked at 14 adolescents with untreated major depression and 14 non-depressed teens, all between 15 and 19 years old. The researchers ran the experimental blood test looking for 26 genetic markers that had been identified by earlier rat studies. In comparing depressed teens with non-depressed ones, the researchers distinguished 11 of the markers may be tied to depression. "These 11 genes are probably the tip of the iceberg because depression is a complex illness," Redei said in the statement. "But it's an entree into a much bigger phenomenon that has to be explored. It clearly indicates we can diagnose from blood and create a blood diagnosis test for depression." A closer look showed 18 of the 26 markers distinguished between major depression and a subtype of the disorder, major depression with anxiety. That might help lead to more specific treatments, the researchers said. Dr. Michael Thase, a professor of psychiatry at the University of Pennsylvania Perelman School of Medicine, said even though it was tested on teens, the blood test might help adults. "This is very interesting early research that could point to the development of not just biomarkers, but also help with the identification of new genes that are involved with the expression of this common illness," Thase told MSNBC. He was not involved in the research. "That could potentially lead to new treatments." Dr. Alexander B. Niculescu, III, associate professor of psychiatry and medical neuroscience at Indiana University School of Medicine, downplayed the study's implications, telling WebMD, "We need to be careful not to jump to conclusions based on a small number of study participants." adding blood markers for depression may vary among a larger population. 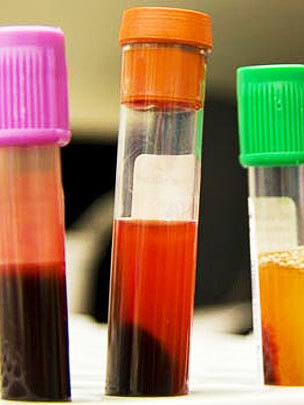 Redei however hopes a blood test could legitimize a depression diagnosis for some skeptics.